WASHINGTON/BANGKOK The United States has decided to remove Thailand from its list of worst human trafficking offenders, officials said, a move that could help smooth relations with Bangkok’s military-run government. The upgrade, confirmed to Reuters by a U.S. official in Washington and a Bangkok-based official from an international organization with direct knowledge of the rankings, would mark a rare boost for U.S.-Thai relations. Ties between the countries have flat-lined since the Thai military seized power in a 2014 coup that Washington strongly condemned. It also comes as President Barack Obama works to forge a united front among wavering Southeast Asian countries against China’s pursuit of its territorial claims in the South China Sea. Bangkok has protested publicly to Washington that it should be removed from the lowest ranking on the State Department’s annual Trafficking in Persons (TIP) report, which is due to be released on Thursday. The report is expected to cite improvements in Thailand’s efforts to combat human trafficking, especially in its vital multibillion-dollar seafood industry, the U.S. official said. The upgrade would put Thailand on a so-called “Tier 2 Watch List” and remove it from the rating for countries with the worst human-trafficking records, known as Tier 3. 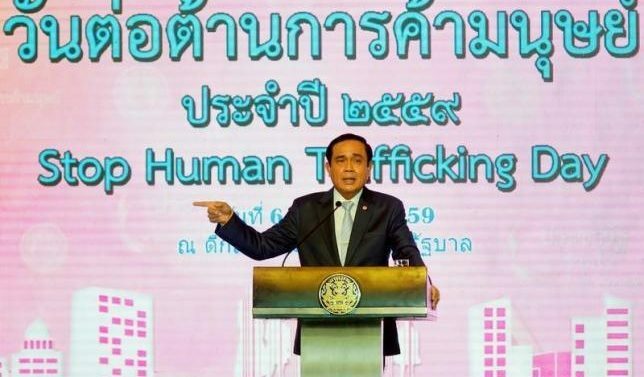 Major General Sansern Kaewkamnerd, spokesman for the Thai premier’s office, said the upgrade shows Prime Minister Prayuth Chan-ocha had stuck to his pledge to fight human trafficking in response to international criticism. “The international community will see that what the prime minister told the international community he would do, he did,” Sansern told Reuters. Thai Defense Minister General Prawit Wongsuwan said the upgrade to Tier 2 Watch List did not mean Thailand will stop tackling trafficking issues. “Even though we will be moved to Tier 2 we need to keep solving this problem,” said Prawit. The report organizes countries into tiers based on trafficking records: Tier 1 for nations that meet minimum U.S. standards; Tier 2 for those making significant efforts to meet those standards; Tier 2 “Watch List” for those that deserve special scrutiny; and Tier 3 for countries that are not making significant efforts. Thai officials were incensed last year when Malaysia was upgraded from Tier 3 but Thailand was not, and even human rights advocates agreed that Bangkok had made a greater effort to curb human trafficking than Kuala Lumpur had. In this year’s report, the State Department has opted to keep Malaysia at the higher ranking it received last year, according to the U.S. official. The junta has repeatedly vowed to crack down on human trafficking, particularly in its multi-billion-dollar seafood industry. Thailand is the world’s third-largest seafood exporter, and much of the labor the fishing industry employs comes from neighboring Cambodia, Laos and Myanmar. Thailand recently reformed its anti-trafficking laws and introduced a system to track fishing vessels, part of what it called “comprehensive and irreversible” measures to clean up its supply chain and curb illegal, unregulated and unreported fishing. But rights groups say millions of migrant workers remain vulnerable to abuse in the fishing sector and other Thai industries. Investigations by news organizations and rights groups have exposed widespread trafficking and abuse, sparking fears of a consumer backlash in the West against Thai-sourced seafood. The Obama administration has been unsettled by China’s warming ties with the Thai junta, which has sought to counterbalance the cooling of its traditionally strong U.S. relationship, U.S. officials say. A Reuters investigation published last August found that senior diplomats repeatedly overruled the State Department’s anti-trafficking unit and inflated the grades of 14 strategically important countries, including Malaysia. The State Department denied any political considerations but U.S. lawmakers raised questions about the report’s credibility and called for reforms. The TIP report matters to Thailand’s generals not only because the U.S. appraisal could affect a key industry. The junta, widely criticized at home and struggling to kick-start a sluggish economy, also is keen to boost its record for tackling issues that previous, civilian governments did little about.